One of the simplest things you can do on your blog to increase page views or encourage comments in your blog is to add a gadget or widget that displays recent comments and posts in your sidebar of your blog. There area a number of coders out there who are doing great things with hacks for Blogger that display your recent comments and posts in fancy ways. I'll probably link to those later but for the mean time you can get easy recent comments and posts in Blogger. You don't need to know any code or do anything to your template you just need to add a gadget/widget page element with the appropriate feed URL. For this to work your blog has to publish a feed. There are drawbacks to publishing a feed but there are also benefits like adding interactivity to your blog with these kinds of gadgets and widgets. If you want to add a list of recent comments to your blog click the Settings tab/link. Once there click site feed and configure your feed setting and click Save. Now go to Layout and click Add a Gadget in the sidebar or footer of your choice and choose Feed. Is what I added for this blog since I'm blogging with a custom domain. In the next window the Title of the gadget/widget was www.GardenBloggers.com but I changed it to "Recent Comments." 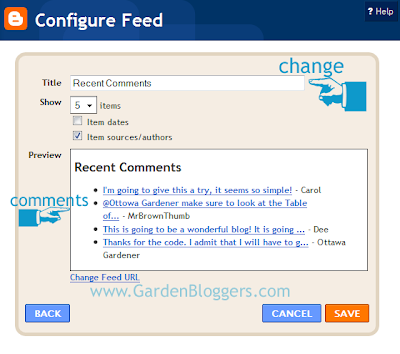 You can get creative with your title if you like and customize it for your garden blog. Some examples could be: "Gardeners Visited," "Seeds Sown," "Pollinators Landed," you get the idea. The max number of items (items here being the # of comments) is 5 because of a Blogger limitation. You can choose to show the date and the source/author or leave it blank, I like that option so I used that one. When you're done hit Save and move the gadget/widget up and down your sidebar to wherever you like. The section in red will be whatever you named your feed. If you copy and paste these remember to change the sections in red to the name of your garden blog. On my personal garden blog I use the recent posts tip above to advertise the recent posts on all of my garden blogs in my sidebars. If you host more than one garden blog direct visitors among all of your blogs by using this tip. Sometimes the recent comments feed get stuck or jammed. If that happens either wait it out until Blogger fixes it or try reinstalling it. This is an interesting blog. Are you going to post at all on your MrBrownThumb blog? I stop by there just to check--and it's been awhile since I saw any new posts. Thanks for letting me know about this blog. There's a lot of valuable info here! I just posted on the MrBrownThumb blog the day before yesterday. I'll be keeping that blog until the day I run out of space on Blogger. I started this one to indulge the geeky side of blogging. A couple of winters ago I spent a lot of time blogging about blogging and I figure I can keep my plant blog clutter free this way.